Participating Guilds need to record their GvG's for any issues during matchup disputes. Each GvG will be best of 7 consecutive rounds, there is no time limit. Semi-Finals and Finals will be best of 9. There will be a max time limit of 3 minutes in between rounds. Round is complete when driver calls "gg" or everyone has been defeated. No re-rez after full down. 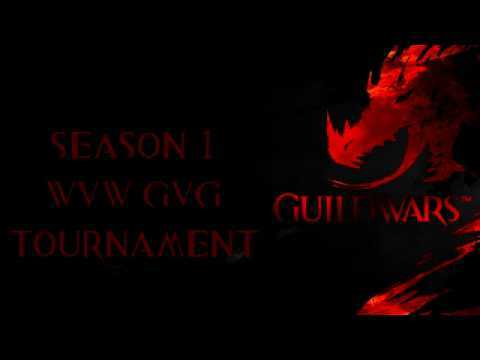 Each Participating Guild will require to whisper me end score and winner of GVG, "will be required"
Guilds will have 15 min from the day of matchup to arrive, if not you forfeit from the time of matchup or if both do a no call no show both will be disqualified from the Tournament. AND RETURNING TO STREAM IS ROY AND GREGOR. FOR ADMINS I HAVE BOOCH RETURNING BACK ALONG SIDE ROY!!! AND AGAIN THIS YEAR, MIKE Z. WILL MAKE HIS APPEARANCE AGAIN TO SAY HI! And I am working on a special surprise before we kick off the GvG Tournament, stay tuned for updates!!! Here is the link to all our previous matches from last year!! Great opening but who is TAG? Not heard of them but they won the finals last year? Are they under a different name now? TBT should have won tbh. Does no prebuffing mean absolutely no prebuffing. Like guardians cannot drop symbols for swiftness before the timer, rev's cannot have facets active, etc. In normal GvG's everyone is prebuffing with these. If this is the case I think you should clarify right now what the penalty is for prebuffing. Like if someone is caught prebuffing and wins the round their opponent can request that round does not count if they lose. I would say there should also be a 2-3 second window where prebuffing would not be a redo unless it is done consistently every round because then you will end up in a situation where people are just looking for redo's when they lose. I would prefer no stealth before the agreed start time and no forward movement instead of no prebuffing. Pin snipping can be harsh but it is a valid tactic. Does multiple pulls count as pin snipping? Looking forward to seeing the matchups, hopefully less one sided games than last year. Good luck to everyone! Nice, now please transfer again. Are you looking for sideline umpires? if so, i'm down. Were you planning on entering Kryta for the tournament this year? Nice to see a tournament. Nice to see NA scraping together 16 teams. Very nice to see a double-elimination format, I think it will fit the mode/idea well. (rolls eyes) I think we all know this is an Alliance Audition. And to call it a tournament for fun sakes would be a lie. Your all figuring out who to hook up with when Alliances get launched. Don't deny it. We all know about it. Some of your people "talk too much". They spilled the beans. That's such an absurd assertion. If you've been in the gvg scene, you would understand that over 50% of the guilds disband after a tournament. That assumes that alliances haven't already formed and don't already consist of 4-5 guilds constantly holding hands together. That is the endgame, after all. Don't need tryouts for that. Actually that would be a great contest. But it's not a gvg. A real top guild won't stoop so low as to form an alliance with their strongest rivals just to stomp on the rest for easy bags. A real top guild lives to fight other top guilds. All those guilds that bandwagon and chest thump every week one-pushing pug zergs need a reality check. None of these guilds deserves the title of strongest. VR is probably one of the few guilds left that deserves the title of strongest. We don't even GVG much and had like 1 scrim so by know means are we even close to the favorites. Any updates with the tournament? Team Roster, schedule etc? I'm very excited to announce that the 2nd NA GvG Season is beginning tonight, at roughly 8pm EST (that's 2am CET for anyone from EU who will be awake). Some of you may remember the 1st Season we held last year, if you'd like, several of the GvG's from last year can be found here. This year's Season is going to be a little different. We decided to make the Tournament Bracket a double elimination bracket instead of single elimination like last year, and we'll also be having guilds do at least 2 GvG's per week, to cut down on the length of the Season overall. A full schedule can be found here which will be regularly updated as new GvG's are scheduled. A full list of the rules can be found here. Monsters Inc [BOO] returning from last year, a guild who's been around for several years, and participated in several tournaments on NA. We [Hate] Everything also returning from last year, and the hosts of the GvG Season's. Midnight Mafia [MM] another veteran guild who most people from NA will recognize, also returning from last year. Three Guild All Noob [ReKS] a combination of Retired [Re] and Krytan Stormguard [KS] who formed up together for their first tournament appearance. Perpetually Mad and Angry [PMA] formed up in September, this will also be their first tournament. Strike Force [SF] another familiar name from the NA scene, who did not participate in last years tournament. Lucent Coalition [LC] participating last year under the name [DEF], led by Toxic Justin, who is in fact, not Toxic. 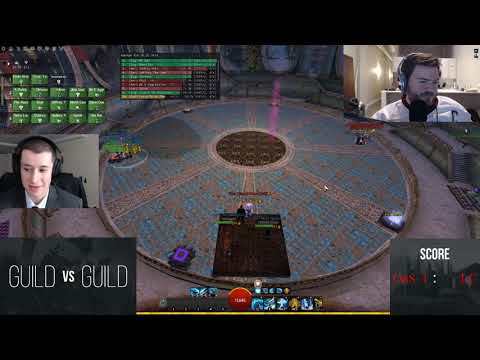 Violent Resolution [VR] looking to break into the GvG scene, VR will be participating in their first tournament as a guild. Onslaught [OnS] our last veteran guild of this bracket, missed the tournament last year, but will be debuting the Season tonight. And finally, to end our list of guilds, we come to The End [TE] (see what I did there?) who are also a fairly new guild to the scene, led by veteran Guild Leader Joey, participating in their first tournament. The first GvG of the Tournament will start tonight at 9pm, but I will be streaming at around 8pm to go over rules, the brackets, and do some Pre-GvG analysis. The match tonight will be streamed here but several will also be streamed on Gregors Channel. The schedule linked above will have the stream location for each GvG whenever they are decided. If anyone has any questions feel free to pm/comment, and otherwise we hope to see you in the streams to come! Good luck and thank you to all the guilds participating! Here is the link to the bracket. [GvG] Reform would like to participate. Unfortunately, its too late to register, sorry! Why did the expansion teams get a free pass into the playoffs? (Wavy, TE, Reks?) While veteran wvw dynasties such as OnS, SF, and Hate are being treated like the Cleveland Browns? Placement were based upon ranking. Ideally there would have been 16 teams and every team would have had a first round opponent but with 11 teams there needed to be placements into the second round. Placements were based upon actual results of scrims. It seems fair, to me at least, to make the first round more competitive with as even matchups as possible instead of advancing teams because they have existed longer. It's a good thing the first round matchup gave the desired competitive result of 4-0! 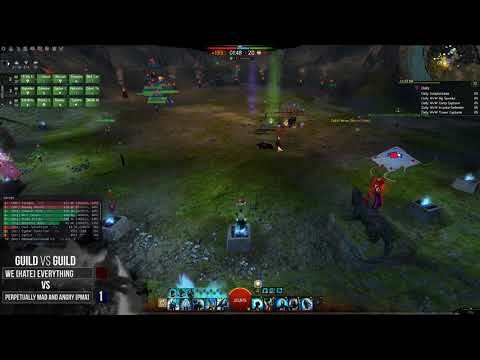 Only thing more competitive is Anet and WvW. Didn't last year start with a 4-0 game too? Maybe they should have done Hate vs LC and OnS vs PMA, but it would be a bit unfair to OnS and PMA who are both higher seeds. The 2nd round should have more interesting matchups. Many players look forward to the annual WvW Pro Bowl. I hope next year they add skills competition. Something similar to the beetlecar race tracks but with warclaw. I hope all guilds will one day be represented equally by submitting their best players to temporary guilds! Fun stuff, ty HATE for setting this up, especially in these Dark Times for ANet. TONIGHT WE HAVE A DOUBLE HEADER! Both matches should be exciting!!! Enjoyed watching the gvgs last night and thanks for steaming them. TONIGHT WE HAVE ANOTHER EXCITING MATCH [BOO] Vs [VR]!! This match starts at 10 est and will be streamed by Gregor!! I enjoyed watching the fights so far and am looking forward to the rest of them. 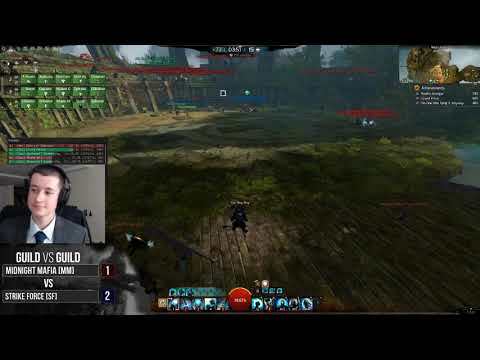 Thanks for organizing this GvG tourney, this is what Anet should have dumped their eSports dollars into back in the day. Tonight we have another amazing match up! It will be [LC] vs [BOO]!! Roy__ is now live on ! Go check it out wink! +respect to [Hate] guild for organising this tournament. Takes lot of effort and time! Also holy kitten [MM] vs [SF] was hella close!